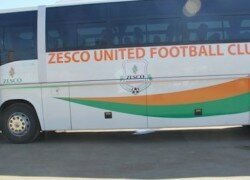 TWO planes have been chartered by the soccer fans to go and cheer Zesco United in the return match in the semi-finals of the CAF champions’ league against Mamelodi Sundowns in South Africa. Zambia Sports Fans’ Association (ZASPOFA) patron Peter Makembo told the Daily Sports yesterday that Zesco United had exceeded all fans’ expectations in the tournament and that the players needed massive support from the local fans when they travel to South Africa for the concluding fixture on September 24.Makembo said the association was looking forward to a better result in South Africa from the Ndola-based giants as they had stamped their authority on the continental stage by qualifying to the semis ahead of bigger teams which were favourites. He noted that Sundowns was a big team which needed to be taken seriously but said he never doubted the credibility of the Zesco squad as the team had what it took to play in the final and win the coveted prize. He urged the players to put in their very best in the first leg of the semi-final when they host the South African giants at home on September 17 so that the return leg could only be a formality.He said being Zambia’s flag bearers in continental football, fans from across the country would rally behind the team and travel with the team to give it the moral support it needed to motivate the players to get a positive result away from home. He said as soon as modalities in place, fans wishing to travel by air and those travelling by road would be notified about the cost for transport so that they could plan ahead. “We are chartering two planes for those who can manage to travel by air ; we are also considering hiring five higer buses for the other group wishing to travel by road,” he said. He however appealed to the players to kill off the game in the first leg at home so that they were not under pressure during the return leg in South Africa. “We have always believed in Zesco and we know they will deliver the results we need. We want to see them in the final of this tournament and so, I am advising all the fans to travel to Ndola in huge numbers on September 17 as we strategize on the South African trip,” said Makembo.